To put it simply, Vedic or Hindu Astrology is a comprehensive system which allows one to understand a person's life from both an overview, and from a chronological perspective. I offer in depth life readings, looking at the fundamental aspects of a person's chart, allowing you to have a sense of what destiny has in store for you in this life, or the last. This can also be useful, in understanding another person, like a lover, or a child, or possibly even your favorite celebrity. My readings draw upon knowledge compiled more then five thousand years ago, and combined with modern technology allowing for precision never before experienced. I have been studying Vedic astrology for more than eight years, and still am, continually adding to my abilities. The Vedic system of astrology—Jyotisha—originated in India through the intuitive insights of seers, in a culture that recognized the divine essence of psychotropic drugs. With the help of brilliant mathematicians, and the drink of the gods (Soma), made from a now extinct hallucinogenic plant, these great sages developed and codified their astrological insights into a vast and unsurpassed body of scientific knowledge which is called The Vedas, the most ancient spiritual texts of India. The limb of these texts devoted to the science of astrology, was considered the most holy. Jyotish was first mentioned in the Rig Veda, and references were also made in the classical Indian epics, the Ramayana, the Mahabharata, and the classic Bhagavad-Gita. From a Hindu and Buddhist point of view, the actions we take in each life, help define the next in a continual path towards spiritual enlightenment. The nature and qualities of our karmas are directly reflected in the astrological configuration of the planets at the time of one’s birth. Vedic astrology interprets these karmas with remarkable accuracy and depth, allowing us to see what difficulties and what challenges are to be faced in this lifetime. This profound science and art, inexhaustible in its wisdom, reveals the fundamental karmic patterns and potentials of each individual soul both on a spiritual and a material plane. Vedic astrology also provides a precise chronology of unfolding experience throughout a person’s lifetime. Vedic astrology can provide profound insights into the nature of our souls and personality strengths and weaknesses, desires and fears, aspirations and hardships, and how we may best accomplish our purpose or destiny in this life. I interpret your Vedic chart and provide you all the insights and details available to me. 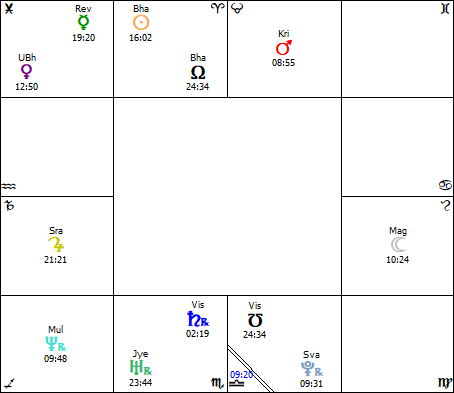 To the right you can see a sample chart, in this case my own birth chart. This is how your chart will look, twelve squares for the twelve signs and twelves houses. The first house among the signs is the one with the slanted double lines, the rest proceeding clockwise. There are also twenty seven lunar mansions or constellations that planets fall into shown here as abbreviated letters above the planetary glyphs. Each house has very different meanings associated with it, and can speak about specific aspects of a persons life. You will receive a printout of your main chart, as well as other accompanying information about your sign, the meaning of Rahu and Ketu for your specific chart configuration, etc.